Infants' Advil® and Children's Advil®: Provides up to 8 hours of fever relief with just one dose! 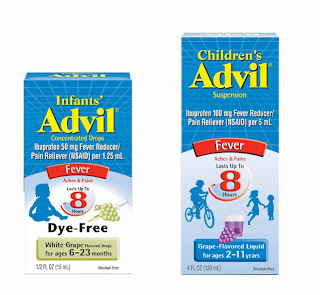 Children’s Advil® is the #1 Selling Children’s Fever Brand**.Nothing reduces a fever faster* or keeps it down longer than Children’s Advil®+. You can feel confident knowing that Infants' Advil® and Children’s Advil® are safe and effective when used as directed. Reduces fever, relieves minor aches and pains due to the common cold, flu, headaches, and toothaches. Also works well for teething pain. If you are unsure about using Infants’ Advil® or Children’s Advil® talk to your pediatrician. Also, look for fever resources and high value coupons at your pediatrician’s office while supplies last. Questions or comments regarding any Advil® products call toll free 1-800-88ADVIL or 1-800-882-3845Monday-Friday, 9 a.m.-5 p.m. EST or ask your pharmacist, doctor or health care professional. Disclosure~ I received a free sample to try the product from Smiley360.com.